The years are starting to feel like roller coasters to me, always fast, always exhilarating and sometimes frightening. But the ride is always worth taking, that’s for sure. The lessons learned and the caring given make the balance work out right. I must be the luckiest person in the world. I have a “job” that allows me to get hundreds of children hugs every day. These kids are like little flowers and when they rush up to me to hug me when I arrive at their place, I always feel like I’ve been given the most precious bouquet in the world. It is so alive and so full of gentleness. Thank you to the children…. This year we continued our long standing relationship with Juan Sanchez of the Huetar reserve and were able to have many groups benefit from his teaching in nature. Our Cabecar friends were thrilled to be able to inaugurate their brand new six room clinic at the top of the hill on their reserve. This construction of the clinic was supervised by Alex Mora, one of the workers at the government clinic nearby. Here, the population of indigenous will be attended by the government heath system with our volunteers offering supplemental and preventative care. We thank our donors, McMath school, Overland Adventures group, UURICA group, and other individuals for their support of this $20,000 project. We also continued to support our tourism and artesan initiative with the women of the community, sending groups to them at least every month. The women have now developed a series of cultural lessons so that when groups arrive they can try their hand at making twine, lighting a fire, or making bark cloth, among other things. Visitors are hosted at the cultural center we built last year and Dona Miriam who lives on the property has helped us with the food preparation. We had four volunteers stay at her house this year and they were able to go to the Chumiko community nearby to give English classes. At that school where 32 children attend, we also were able to construct the first school lunchroom and bathroom complete with toilet and running water. Teacher Harvey tells us that he had to teach the kids to sit at a table to eat and how to use a spoon instead of hands to eat with. So many thanks to Chris Thomas for her undying loyalty and enthusiasm for these women and their project. At the end of the year, we were able to give five large waterholding tanks for the schools and clinics, blankets to all the women and children and boots to everyone thanks to the Quimtek company in Costa Rica. 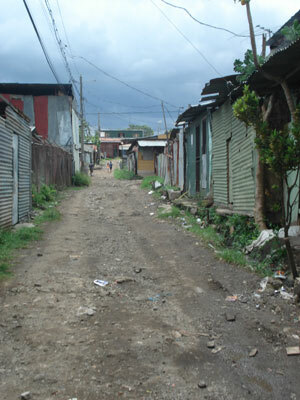 As last year, one of our biggest areas of work is in the La Carpio immigrant community. Here, we continued to maintain our clinic helping an average of 25 patients per day with illnesses from asthma to stomach problems to accidents to birth control. We have had scores of medical students, both from the States and Costa Rica work in our clinic as a lab experience and Dr. Sanchez has been a major force in this initiative. We were very saddened this year when Xinia, our community health worker and supervisor of the day to day management of the clinic passed away. She had been ill for some time due to heart surgery she had several years ago. The people in the community miss her a great deal and her spirit stays with us as we continue our work. We were also very sad when Patrick, one of my favorite two year old who lived near the clinic in La Carpio died of chicken pox this year. We will miss him very much. Upstairs in the Model Education Center, we continue to work with the children in two sessions per day and have developed with the four local teachers systems for planning and carrying out our classes. We continued to receive high quality educational materials and supplies from the local private schools and from our great volunteers. The women attend weekly training sessions with me as well as having gone to different educational centers around the area to improve their skills. Our daycare center La Libertad flourished this year as we helped in all areas to make it possible for children from that sector to have education and a hot lunch program. Thanks to volunteers Dana and Frances from Duke Univeristy, we were proud to be able to entice the children and parents who live down by the river to come up to the center and participate in our activities. It is so gratifying to see the kids who live in the most dire circumstances have the chance to be with other kids and to participate in supervised activities. The lunch program is very important to them because most of them are not eating during the day. Our volunteers from McRoberts school created a wonderful children’s park in the back area of the center complete with grass and a playground. Amazing. For these kids this is like Disneyland! We now have four fulltime and trained local women running this center. We are grateful to Nancy who started our lunch for the women’s support group and to all the volunteers from CPI/WCC who helped with the beautification of the whole area by painting wonderful murals. The students from Global College also did a great job helping with the muralization. With the help of Oceana and Max, we began a process of empowerment and cleansing in this community that has resulted in the planting of a garden and the beginning of a composting project. They were also kind enough to bring donations of hygiene and beauty supplies to the women. With a donation of very elegant men’s clothing and some new shoes and socks from Jeff Fischer, we were able to help out a group of local “drunks on the corner” in La Libertad. Just by having someone pay attention to them and ask them to help with our projects, “Jeff’s boys” got up off the ground and participated with our volunteers. It was so moving to see them greet the volunteers, help with the painting and treat them to a serenade upon their arrival. Jeff was also kind enough to give some funds so that we could buy a home for Flor and her four wonderful little children in La Libertad. She is now working and the kids are being helped by child welfare as we stabilize her situation even more. With a donation from the Bird Charitable Trust, we were able to combine forces with the community and construct a concrete road from the top of the hill down the daycare center. It was wonderful to see over 50 community members out every weekend for six weeks to complete this project. We were also able to make some improvements on the construction and hopefully have solved the leaking water problem so that we won’t have flooding anymore. In the San Vicente section of La Carpio, volunteer Sarah from Global College did the fundraising and facilitated the building of a fence around the only place the kids can play soccer in the area. Now, the youth of the area have a place they can go to hang out and challenge each other to games. We continue to work with community leaders in this area to find ways to limit the negative effects of the landfill. We have liasoned with people from across the ravine in the upper income community of Cariari to make it possible for the company running the landfill to show some cooperate responsibility for the health and well being of the people forced to live nearby. We thank Bob Epstein for his encouragement in this area as well as for his generous donation to our work. He came to visit us this year and was quite taken with the experience of La Carpio.. As he says, it is one thing to read about this place, but quite another to actually be here. You got that one right! The group Lifeworks created a wonderful playground and safe play area for the children in the kindergarten next to the clinic. Thanks to their hard work, the children now have a green area in which to enjoy their days. Also, this group took all 600 kids to the Children’s Museum for an outing. Children from La Carpio were also treated to a day of “camp” at a local recreation area. Over 100 kids and 50 volunteers shared their time together swimming, playing soccer, dancing and doing crafts. It was a once in a lifetime experience for these children. Thanks to the CPI/WCC group for this activity. Our soccer teams in La Carpio continue to exist. For a short time, we had a good coach for them but he had to leave. So, we are doing the best we can. We did get soccer shoes and uniforms for four teams thanks to the donation of the McMath school students. Housing in La Carpio is a big issue for us and this year we were able to provide houses for three women and their families. We have a waiting list of three more women and hope to get them resettled early in the next year. The land in Carpio is finally being titled, thus property values may soon go up, making it more difficult to afford houses for the women. We hope to find donors soon so that these families can move up from the rivers and live in more safe housing. At this low income community we were able through the Overland groups to paint murals and have activities with children. Common Ground Medical group and UCLA students were able to do medical missions there and we are continuing to try to care for the medical needs of this underserved population. In addition, thanks to the initiative of Dianne Globerman, we completely cleaned up another section of Puentes, getting rid of a nasty garbage bin and replacing it with metal baskets and a beautiful mural. With the help of Cecilie we were able to have weekly art classes for the children of this section and developed a wonderful display of their work. We distributed hundreds of pairs of shoes and bags of clothing thanks to the cooperation of the Helping Hands group of volunteers who collected the shoes. This organization continues to support our work through fundraisers and donations of food, clothing blankets and shoes. In spite of losing more than half of its student body when the houses they lived in were bulldozed down by the government, the school was once again visited by the volunteers from McMath school. They were able to use the library they had prepared last year to do activities with the children and teach them many new games and educational activities. It is gratifying to see that after several years of work, the classrooms we built and the library we furnished are being used by the children and the teachers. We worked with several different schools this year, providing them with good educational materials, murals and playgrounds as well as lots of educational and fun activities. Thanks to our volunteer from Overland/CPI and AAVE/CPI for this help. Our school insertion program continued this year, as we provided uniforms, schools supplies and shoes to hundreds of children in all the communities where we work We especially thank Helping Hands for their shoe collection program as well as all the other volunteers who brought supplies in their extra suitcases. In addition, with a kind donation from Barry Schwartz, we facilitated the purchase and distribution of school supplies to 11 rural schools in the west coast of Costa Rica. Thanks to Tom for being the inspiration of this project. With the help of the volunteers from CPI/WCC we were able to construct three classrooms in this rural village. Now, students from the surrounding area will be able to go to high school next year in a lovely new building. We were able to paint murals in many different communities and thank especially West Sylvan/CPI for their collaboration in Piedades where they painted a lovely mural on the wall by the soccer field. Our visits to the prisons continued as we tried to give hope and practical skills to these youth. We receive an average of three phone calls per day from these kids and are happy to be able to give them some words of encouragement. We provided them with their hygiene supplies, shoes, clothing and reading and art materials. Some of the kids have gotten out of the prison and have found their way to a job, a house and a stable life away from their old ways. The students from the Roots and Shoots program at Country Day School took the initiative to fundraise and help with food for the homeless this year. Thanks to them, we were able to make several visits to this population and to give them words of encouragement. It is especially gratifying to have these students, who have so much, meet people who don’t even have a pair of socks for their feet. I thank Max also for accompanying me on several other visits to these folks. We continued with our library program this year and were able to build another building at a small school on the BriBri indigenous reserve in the town of Volio. Volunteers from Overland Atlantic were also able to experience the local culture through hikes, canoe trips, visits to traditional communities and a visit to a women’s project. We were able to complete the construction of five different playgrounds and parks with the help of the AAVE, UURICA and WCC volunteers this year. Our former street kids are all settled more or less in what they will be doing. I am looking forward to finding a way to publish my book co-authored by the kids and including their drawings as well. It has been an experience. Statistics might be right. A portion of the kids are still in prison (this is probably the best place for them) a portion have been killed, a portion returned to the streets and some are making an independent life for themselves either here or in Nicaragua. Nela has had her ups and downs all year, but we continued to provide for her and Keyla her daughter. Nela is now living at her mother’s house, looking for a place where she can live and support Keyla on the weekends while I keep her during the week. Keyla may be the one to break the cycle. So far, she is a happy, confident, fun, intelligent and creative little girl She is quite a handful because she is so interested in so many things, but she is in a great school and therefore, on a good path. It has been a blessing for me to have the privilege of sharing my life with this great little girl. We especially thank Doug Lowy for the funds to keep Keyla and Nela housed and clothed and fed and educated during a good part of this year. This upwardly bound low income community turned out to be one of our greatest projects this year. It was so gratifying to see that, as their community center building was renovated and improved, their garden grew and the women flourished. Our tourism initiative program here is in full swing now and the women have developed even more their sociodrama, their folklore dance, their lessons for volunteers, tours of the community, food program and crafts for sale. In addition, they have all been given clothing, food and medical care as needed. We thank Barry Schwartz for his generous donation to this project as well as the Bird Charitable Trust so that we could improve the community center. We now have a kitchen and a bathroom in the center and the main room has new paint, curtains, electricity, ceiling and bars on the windows. The upstairs has a brand new tile floor. Colby College helped us with the construction of this part of the building. Xinia, the teacher we are training has been doing a great job providing a quality education program for the children of the community and all the women have benefited from knowing that their children are learning and growing with us. We are also very grateful to Katia who has dedicated so much time and energy to both the folklore dance troupe and the tutoring program. Thanks to Carol and Fran for their donations to start up these programs. Once again we complete the year celebrating so much together. My son Fransisco hosted special Christmas party for the children of the Carpio Clinic complete with the most humane clown I’ve ever seen. He had the kids spellbound and all he did was whisper. Kelly Belknap and family gave a party for the kids in La Libertad. In addition, Helping Hands collected gently used toys and educational materials so that we can have a Santa’s Workshop – a chance for parents to buy gifts for their own children at affordable prices. They sponsored a party for another group of children from the Carpio clinic, complete with food and games. Vicki Skinner got so enthusiastic about the kids from La Carpio that she hosted yet another group of kids at her Bed and Breakfast along with their mothers. Finally, we sent to Nicaragua clothing, shoes, school supplies and toys collected during the year by our Volunteers to a very impoverished school. We continue to grow and learn in this aspect of our organization. Ana is now a complete expert on the use of Quicken and has spent hours and hours transcribing each and every receipt and payment and donation transaction. She has now prepared a notebook with a summary of all our financial reports from 2001 until the present. She is a natural at this, and finds it creative and stimulating. We have now expanded and have a large team of people helping us to manage all the parts of our volunteer program, including the 12 women who run our education and health programs and our homestay coordinator, Denia. Norma has been a faithful assistant for homestay and project coordination all during this year. And Jose and Tuby have been the ever ready and competent messenger/driver/volunteer transportation team during the whole year. Thanks to all of them for their help and voluntary service. I would like to give a special thanks to Mr. Doug Lowy for his generous and surprise donation at the beginning of this year. Thanks to him, we were able to cover operating costs for our clinic, the daycare center and keep Nela and Keyla housed, clothed and educated for a portion of the year. We are very grateful to him for his interest in our work and his commitment to the improvement of life for women and children living in the most difficult of circumstances. The ripple effect of his donation has been exponential.. Thank you to every one. How can I even begin to name all the wonderful people, organizations, donors, volunteers who have made all of this happen. I especially want to thank my parents who have supported me and this work for all these thirty years in more ways than we can count…. All of you are special and you are blessed and yes, if you ever wonder, you have to know that you are making a difference in the lives of so many. And we all think of you all the time and pray for your well being and peace. Please don’t ever forget this.